“Pokemon can be classified by following criteria: A low reproduction rate (with the offspring being in most cases of its mother’s species), supernatural abilities like extended longevity (in some cases, as seen in the so-called ‘Legendary Pokemon’, it exceeds several thousand years), the ability to control different elements, large-sized bodies, a sudden second and third mutation/maturity stage, some of which are triggered by the radiation of different ores (and a newly-discovered fourth stage, the ‘Mega-Evolution’ which is triggered by ‘Mega Stones’), and near-human/superhuman intellect, even in animals like arthropods. It was generally believed that Pokemon where a whole different act of Creation, or even extraterrestrial life-forms. Bird Pokémon are amongst the most unique and beautiful Pokémon in the world. Many so-called Legendary Pokémon are birds. Birds come in every shape and coloration, and most of the larger ones have been worshipped as the embodiements of gods. 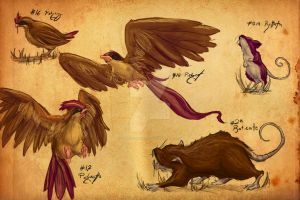 Several bird Pokémon also have additional fingers and claws at their wings, the reason why is not known. -Porygon is an artificial Pokémon that suddenly changed its appearance and gained more sentiency. -Blaziken isn't actually a real bird, as they haven't evolved from a common ancestor. In fact, Blaziken has evolved a stage before Archaeopteryx, so it is closer to dinosaurs than birds. But since Blaziken is very bird-like and not very dinosaur-like, it is here. -Bisharp and Pawniard have evolved from owls, though they have lost their ability to fly and gained a clawed wing instead. -A lot of large ghost-types are owl Pokémon, in fact. Because they sit in the dark and watch people pass by they were believed to be grave guardians or ghosts. -Farfetch'd can not learn Surf. This doesn't make any sense, because this stupid duck was clearly swimming in the anime. PLEASE NOTE: This is how I see the Pokemon. It is fine to be of different opinion, but please tolerate mine. I see you added two new ones. Depends. Porygon itself is dumb in the beginning. It has no instincts, doesn't even know how to feed itself and needs to be taught everything, and does not figure out anything on themselves- but it is good following orders. But eventually, it will 'evolve', spontanously turn into Porygon2 which still follows orders, but is able to figure out problems on their own. PorygonZ is the last stage only few Porygon ever achieve, and this guy doesn't listen to any order, but it works problems out on its own. Farfetch'd looks so much better like this. It always bothered me that it's supposed to be a duck but it's not really built like one. It's not rounded enough and it has a beak that's a little too acute for my liking. Though not entirely correct, technically Goosander are ducks too, and they do have a pointed beak. That's artistic freedom, since ducks do have a small hook at the top of their beaks- and ducks like Donald Duck have a completely flat beak like a platypus. What gets me every time is that Farfetch'd can not learn Surf. I mean it's a duck. It swam in the anime, so why the heck can't it learn Surf?! How differently does Celesteela fly from the other avians? Are the "Mini-noses" really just chick Nosepasses? Can a Yveltal kill a massive amount of people in a short amount of time? Celesteela is huge and not really suited for flying. It needs a lot of running-up, along with the right wind and/or elevation. So once it is in the air, there isn#t much that can make it come down and it just barrels headfirst through any and all obstacles. Yes. Nosepass is the female bird and Probopass is the male- the father takes care of their chicks, which gather around him. More or less. Yveltal is related to condors, being a scavenger. However, it doesn't have enough patience to wait till something drops dead, so it is not uncommon to see Yveltal scare entire herds of animals over cliffs and to their doom for insta-carcasses to eat. By technicality you could actually include these guys with the dinosaurs since modern scientists and cladistics say they are dinosaurs. I already split up the invertebrates because they were too many of them. And now you tell me I should mash them back up together? What are Wynaut and Wobbuffet? Are they Great Auk? I like the more cartoony designs Game Freak has! That's okay, but I wanted to draw them in a realistic style. So the Torchic family is a transitional species between birds and dinosaurs, right? Not really. They evolved from the same ancestor as birds did, but their ancestors already split up before the Archeopteryx. Blaziken is actually more of a bird-like dinosaur, than a real bird. Would you be okay if I used it as a reference when I try to draw out some wings? Do that. Or you just check for flying birds on Google. Works too. YVELTAL SHINY IS A BACON. No. I used a Condor for basis. what is the Pokemon under skamory? Is Ho-Oh a Condor or a Peafowl? Oh, ok. Thanks for clarifying! wow, that is some serious dedication to draw all of these, well done! Isn't Tapu Koko a chicken? Where is he? *EDIT: Never mind, found him. Oh my goodness gracious LOOK AT THIS!! Look at this! My friend Fedora-Fox sent me a link to this and my goodness you're so talented! All these gorgeous birds!